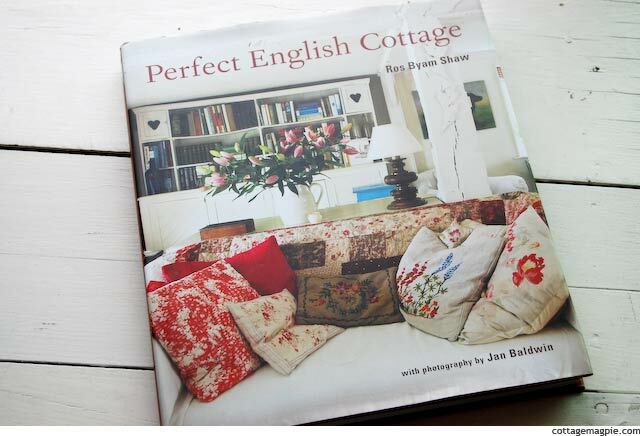 One of my favorite decorating books to read and reference over and over again is Perfect English Cottage by Ros Byam Shaw. Every page has something to study. The book has English cottages of all kinds -- airy and romantic, gilded and elegant, cozy, rustic, clean, beachy... it's a treasure trove of ideas and inspiration. My copy has a veritable forest of bookmarks in it -- little torn bits of paper so I can remember where my favorite pictures are. If that's not enough, each cottage featured is accompanied by a charming story about the home and the owners, giving details about how they found the house and their lives. I admit that I almost never read these kinds of books -- I just look at the pictures. But in this case, I can't help myself, the stories are so entertaining. My favorite section in the book by far is the very first section which is entitled "Romantic" and features three cottages that I am completely in love with. If my home could have the same feel and vibe as these three houses, I would be a happy, happy woman. The first house is a weekend home for Peter Westcott and his partner Andrew Merron. During the week, Peter works for a design firm in London, and he has a passion for vintage fabrics and kitcsh from the 30's through the 50's. It shows in the collected look he's created in his Somerset getaway. The dining room is a perfect example. Check out the vintage curtains and table linens! The living room (or lounge) is one of my favorite rooms in this house. Somehow, he's managed to make the room colorful and eclectic without feeling crowded or overwhelming. I love it. As you can see in the staircase, most of the house is painted in white and neutrals, but there are bits of color such as this bright blue "stair runner" that's been created with paint. I love this bedroom, too. It's bright and airy, yet cozy and funky, just what I love! The next house in this section is Monk's House, the house that Virginia and Leonard Woolf lived in -- first as a holiday retreat, and then in the 1940's, as their permanent home. Some of the greatest minds of the 20th Century were entertained here! The house now belongs to The National Trust, and part of the home is open to the public for show. 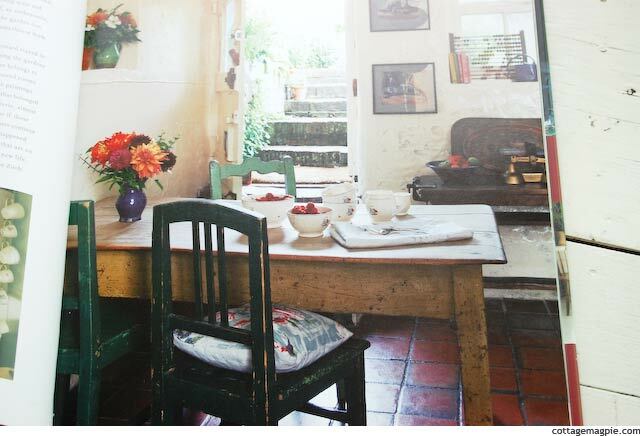 But the rest of the house is home to tenants Jonathan and Caroline Zoob, and this is the portion featured in the book. Isn't this kitchen table amazing? And of course, who doesn't love a clawfoot tub? I love this little vignette, too, with the old quilt top used as a curtain and the wooden cubbies. The last house in the "Romantic" section of Perfect English Cottage is this teeny tiny cottage in Dorset village. Originally built as a farm laborer's cottage, it's only 12 feet wide! The kitchen is only 8 feet square. It's compact, but the owner, Sara Mahon, has made every space count. I love the little floral details in this tiny kitchen nook, as well as the plastered rock wall. In her bedroom is a wee craft nook. Lovely light comes in the window. With the palest of blues on the wall, the guest bedroom is a cheery mix of vintage fabrics and patterns. And that's just the first three cottages in the book! The rest of the book has cottages in different styles. Some are really rustic, some are very elegant. There's loads to look though. I admit I tend to re-read these first three stories over and over, but at least every few times through the book I go through and read some of the other sections, especially Holiday and Simplicity. I bought the book from Amazon.com on a little bit of a whim, and I'm so glad I did! I've included the link to the book on Amazon.com here, which includes an affiliate link for me (a few cents to me if you buy it). Of course, if you can find it at your local bookstore or your library, please do!!! It's worth it.